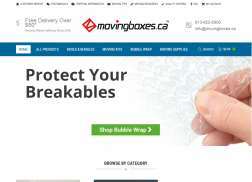 Moving Boxes is an online store that offers a wide variety of boxes and bundles, bubble wraps and moving supplies. Browse the website and choose from featured products such as small moving boxes, popular moving boxes, wardrobe boxes, China boxes and more. Get 5% off all products + Free delivery over $50. Cyber Monday! Get 5% off All Products. Expires on 11/30/2015.